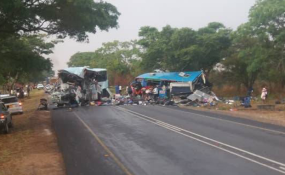 At least 47 people have died in an accident that occurred at the 166km peg along the Harare-Mutare highway today. The accident involved two buses, Bolt Cutter and Smart Express around 5pm. Police spokesperson Assistant Commissioner Paul Nyathi confirmed the accident. By the time of writing, Asst Comm Nyathi said police was still attending the accident scene and the death toll might rise. "So far, 47 people have been confirmed dead, 45 adults and two children," he said.